Pasta is one of our family’s favorite meals — pretty much any type of pasta. The kids love it, Dave and I love it, it’s usually pretty quick and easy to make, it freezes well, and it uses relatively inexpensive ingredients. Win, win, win, win… win! One of our favorite pasta dishes is lasagna. 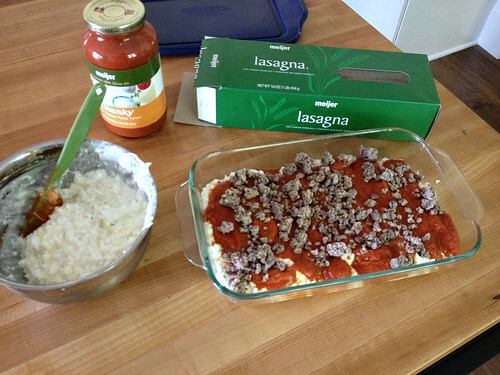 I know some people don’t care for ricotta or cottage cheese, but our kids LOVE it (Dave and I like it too)… so lasagna regularly shows up on our weekly meal plans. I used to think lasagna was SO much work and I dreaded making it. Often, I’d make 2 or 3 at a time and put 2 in the freezer for later. 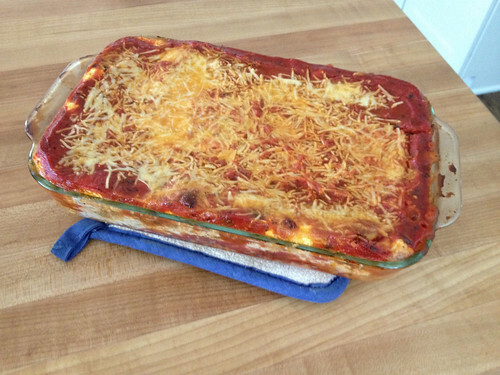 However, the frozen lasagna always seemed to take forever to defrost, and then forever to bake so the top and edges would often get slightly burnt or dried out before the middle was fully heated through. In lieu of more time-consuming lasagna, I started making this Lasagna Pasta Bake a couple years ago, as it makes a smaller batch. However, I still needed to boil the noodles and make the sauce ahead of time. As we add more children to our family, the time I have available for dinner prep continues to get shorter and shorter. So over the summer, I tried a few new ways of making our family favorite lasagna in an effort to find the most simplified, least time-consuming recipe that still tasted great. THIS is what I came up with — and yes, I really can have it oven-ready in 10 minutes or less!! 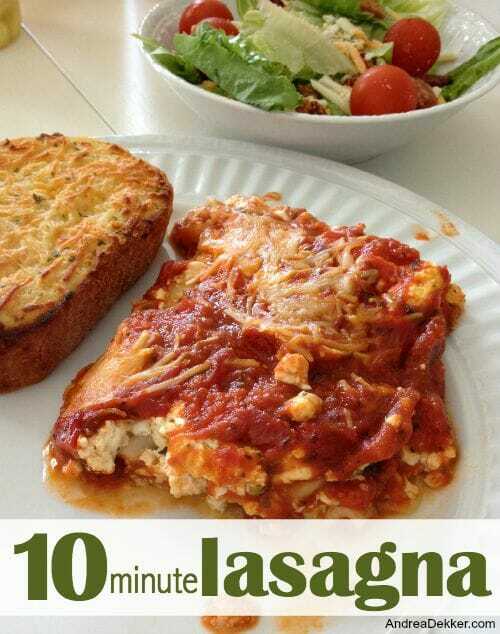 For me, the best part about this recipe is that I can use regular lasagna noodles but I don’t have to boil them first (that’s my most hated part of making lasagna)! It speeds up the process considerably, it’s one less pan for me to wash, and it almost eliminates the possibility of broken noodles. My 10-minute lasagna recipe is so quick and easy, I ALMOST listed it as a “Kids in the Kitchen” recipe… however, Nora didn’t want her pictures taken, so I didn’t push the issue. 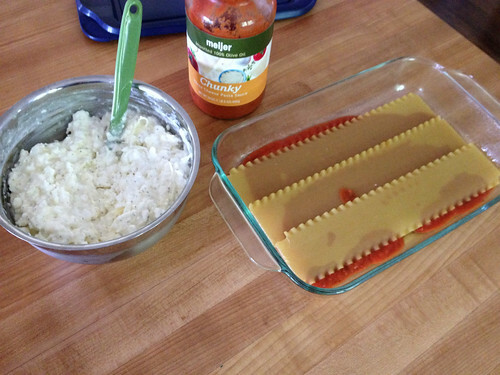 That said, if you’re looking for a recipe to make with kids, or just a quick meal for a busy weeknight, this lasagna should definitely go on one of your upcoming menu plans. I was very skeptical the first time I tried my recipe because I had never tried not boiling the noodles first… however, Dave and I were both thrilled with how well it tasted — and Nora and Simon each had a full piece! I have made this lasagna recipe many times since my first trial run — and every time, it continues to taste great. As with all my recipes, please feel free to mix up the ingredients based on your family’s references. The only thing you need to make sure of is that there is PLENTY of sauce. Since the noodles are dry, they will absorb a lot of the sauce, and if you don’t have enough, the noodles will not get soft enough. What is your go-to pasta recipe? I use egg roll wrappers instead of noodles. They cook quickly and taste great, especially the leftovers. The unbaked lasagne with egg roll wrappers even freezes perfectly. I also cannot tolerate the texture of ricotta or cottage cheese so I use a mixture of gouda, mozarella, and a little parmesan. interesting — I’ll have to try this sometime! I have an easy peasy lasagne recipe too even thought it takes a little planning ahead. My husband makes a killer homemade meat sauce for spaghetti, so evertime he makes it I have him double the recipe. (OK it’s not technically a recipe, he just kind of throws it together) and I freeze half. When I want to make Lasagne I layer the sauce in a pan with frozen cheese ravioli and mozzerella and bake at 350 for 45min- 1hr. If I remember to make it the day before and let it thaw in the fridge overnight it only takes about 30-45 minutes to bake. I’ve even put this in the crockpot ( with one of those liners) for about 2-3hrs on high and it turned out ok, but the cheese doesn’t brown like it does in the oven. Anyway, thought you might like this option too. YUM!! Thanks for sharing Shannon! Hi, I just tried your recipe today and it turned out great. The only adjustment I made was to not pre-cook the meat still came out delicious, everyone enjoyed it. Thanks so much. wow — good to know that even if I don’t have meat already cooked up, i could still get this meal in the oven fairly quickly! Thanks for sharing! I tried this last night for my family. I let it overcook a little because we were headed to church but it tasted delicious. My bunch loves it. I couldn’t believe how easy it was. This is definitely going into our meal rotation. Thanks for another winner. I love your simple recipe for us busy moms. yay — glad you guys liked it!! and yes, it is SOOOOO easy! 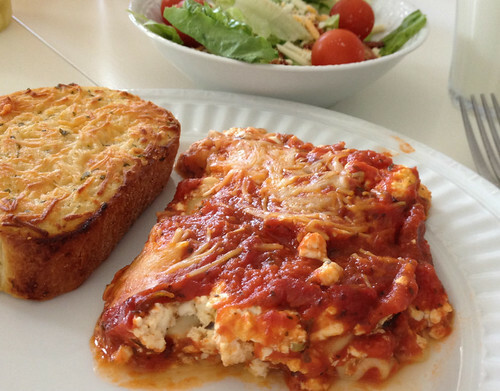 Is that your garlic bread, on the plate, to the left of your lasagna? It looks delicious. I have also been making this recipe for years. My little secret! I use the Barilla no cook noodles mostly because of the size. They are smaller and I can use a 9×9 square pan. For two people, it is plenty for several meals. My family is not fond of Ricotta, so I use cottage cheese. as well. I have not been adding the egg to it but after reading you recipe, I might try it. Also, I was nervous about the liquid, so I add 1/2 can “Fire Roasted” diced tomatoes with the juice. The noodles are nice and moist. 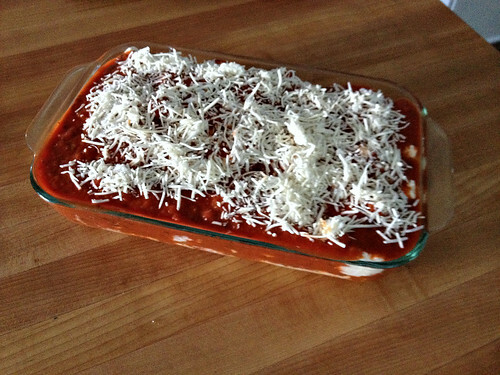 My family loves this recipe and I can put it in the oven in 10 minutes! I learnt about using ricotta or cottage or creme cheese last year – how brilliant is that! Never again will I slave over a bechamel sauce . did you add frozen cooked meat or does it need to be defrosted first? Thanks! 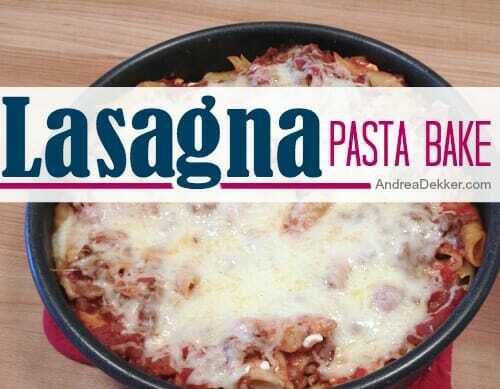 Hey Andrea, just curious why you don’t use the “no boil” lasagna noodles? That’s all I use…. well, the main reason is because they are quite a bit more expensive at my grocery store… and also, they are much smaller so I’d need to use more noodles (making them even more expensive). Also, the only no-boil noodles at our grocery store are very flat and thin (they don’t have the bumps on the edges like regular lasagna noodles) and for some reason, I don’t like the taste/texture as much — but maybe it’s all in my head! Sounds like a winner! At 48 I still can’t cook really well but I’ll be trying this for sure! 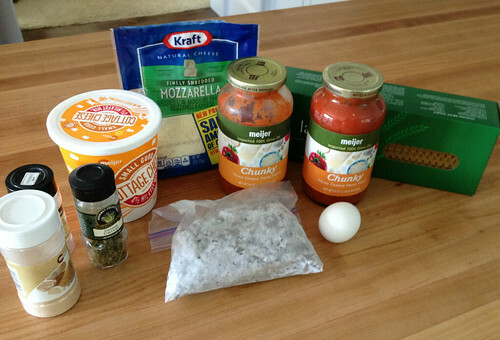 Haha — well if you can dump sauce from a jar and mix up the cheese mixture, you should be good to go! Why are you using cottage cheese and not ricotta? You can use either (as I stated in the recipe). I just use Cottage Cheese because it’s less expensive! Looks delicious!!! Thanks for another great recipe to add to my list. Wondering if you have done any no pre-cooking freezer meals? I loaded up our freezer before baby. They were so easy to put together!! No, I’ve never done “no pre-cooking freezer meals” but I would LOVE to learn more about them. Maybe I’ll have to google them. Thanks! My Mom has been making it this way for as long as I can remember (I am 43). It’s the best kept secret in my opinion. I haven’t boiled noodles in ages and I love it. Glad your family liked it. 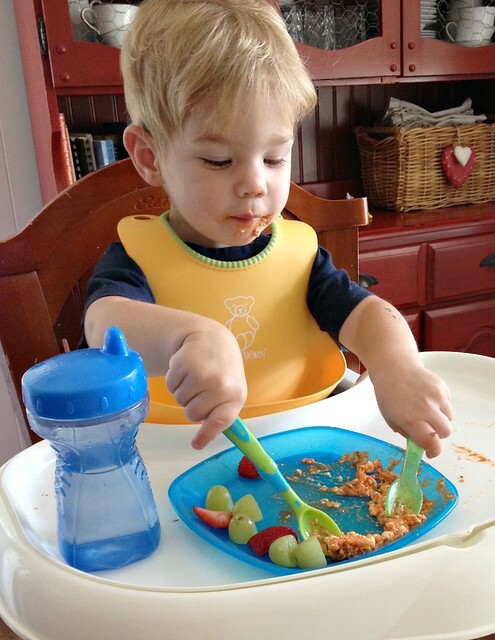 It makes life simpler and it makes it easier for kids who like to cook with Mom/Dad to help. Yes, I’m so glad I know I don’t have to boil the noodles anymore. I might just have to start making all my pasta “casseroles” this way! Yup, once I “discovered” that I could use regular noodles without cooking them first (just add more liquid to the recipe, either more sauce or a little water) I have never gone back!! My least favorite part of making lasagna (boiling noodles) now eliminated! Yay!! exactly… that’s my least favorite part too!